Young children learn best by "doing." These songs invite active involvement in mastering a wealth of knowledge and skills. Subjects include colors, numbers, letters, phonics, days of the week, animals, opposites, occupations, sight words, basic motor skills and more. Music, movement and social interaction come together in a joyous celebration of learning! This updated version includes additional songs and improvements to existing songs. 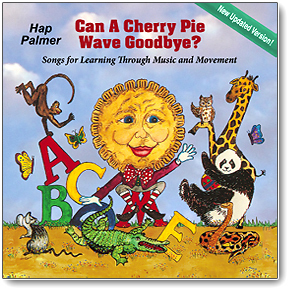 Deeply respected children's music artist/educator and rhythm master Hap Palmer has given his 1993 album (winner of the American Library Association's "Best of the Best for Children") a considerable update here. Among the new songs on this expertly conceived educational album of "Songs for Learning Through Music and Movement" are "Words We Most Often Use," a prosaic title for a jaunty resource for beginning readers; and "A Tree Fell Down," an engaging guide to prepositions. It asks children to imagine ways to get past a fallen tree ("over, "under," "around"), with sprightly banjo and harmonica accompaniment, and musical sound effects. Other songs teach number recognition, colors, opposites, and grammar. To reach a wider age range, the Palmer has included "basic" versions of some tracks for his youngest listeners. Palmer's clear and comprehensive teacher guide at his website gives song lyrics and identifies activities with variations, objectives, follow-up suggestions and more. Lynne Heffley ©2018 Parents' Choice – A freelance writer and editor for the arts and non-profit organizations, Lynne is a former staff writer for the Los Angeles Times, where she established the paper's first weekly children's arts and entertainment beat. I loved the fact that a free teaching guide accompanies each song. For example, in Can A Cherry Pie Wave Goodbye? the activity instructs you to nod or shake your head for yes and no answers. This incorporates movement, which engages the listener, and also helps children distinguish between fantasy and reality. The follow up questions ask things such as "Which imaginary situation did you find funniest?" Enhancement activities ask listeners to draw a picture that shows what the situation would look like, and even challenges kids to think of other rhymes that describe both imaginary and real situations. I liked the variety of songs. We played this CD during our morning routine. There are a lot of academic songs included. I really liked the Weekly Rap, which helps children memorize the days of the week. I like that there is a free teaching guide online too! The songs develop listening skills, color, letter, and number recognition, teach the days of the week, opposites, occupations, body parts, directional prepositions and verbs, sight words, basic motor skills, fantasy vs. reality, and much more. 3. Can A Cherry Pie Wave Goodbye?